In line with that, OKA asked Sally to select her favourite picks from their new Spring collection and show you how architectural and decorative lighting come together. What is the best way of creating mood and atmosphere with lighting? I combine a mixture of uplights with focused downlights, with soft side lighting from lamps and maybe feature pendants, to create different layers. What should we consider when lighting a hallway? In the hallway, I placed this fabulous console table and I paired it with two OKA Dige lamps because I loved the random dots highlighting the black and white picture, but it would have fallen into darkness if I hadn’t already used John Cullen’s Polespring medium beam downlight to focus, not only on the picture but also on the flowers. 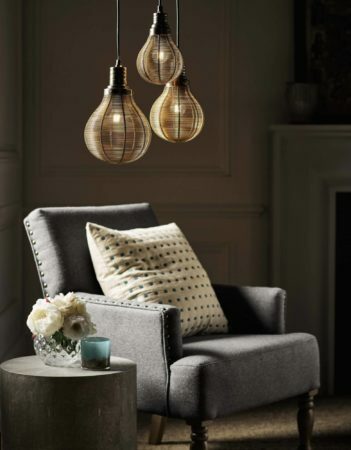 How can you create cosy lighting for a sitting room? 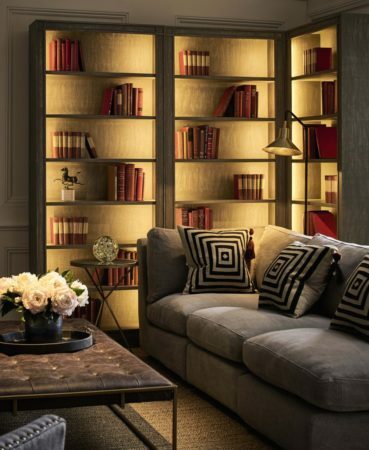 The key thing in every sitting room is the layering of light – it should always be at different levels. The shelves in the sitting room above create a wonderful focus point. We lit them up using John Cullen’s Contour HD24 LED strip, for a warm glow that acts almost like lamp light. We combined it with a brass floor lamp; this gives a focused softness and also highlights the cushion. What things should you consider when lighting a large room? 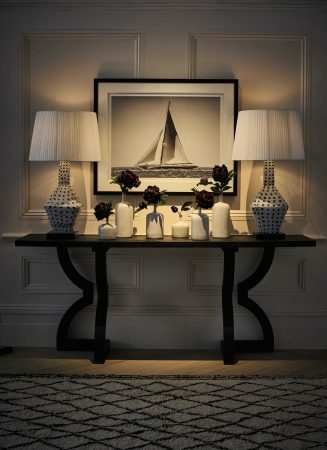 What’s essential in any room is not to forget the centre, so often coffee tables remain unlit in large sitting rooms. I chose to light this large leather and brass coffee table with a very narrow beam focus, using a Polespring LED downlight to highlight the flowers. 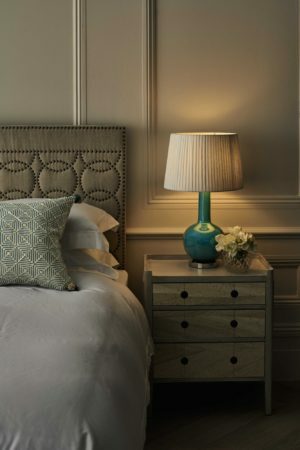 What lamp is best for beside a bed? I chose this teal ceramic lamp for a shot of colour and also for its size. If a lamp is the only source of light by your bed, you should always make sure the bottom of the shade is at level height with your shoulders. The cast of light will then shine over you and your book, for reading. If it is lower, you’ll be falling out of bed to read, and if it is higher, you’ll get glare from the light source. For more decorative lighting inspirations, visit OKA’s website.